Drumcode Festival presented by Adam Beyer & Awakenings announce set times for stellar techno line-up. 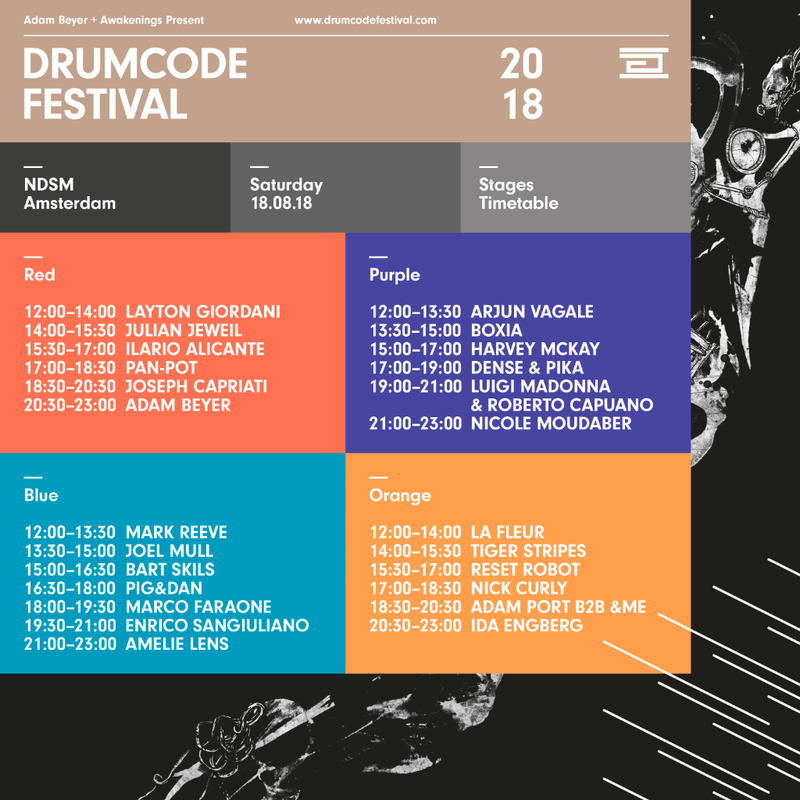 AMSTERDAM, JULY 4th | Swedish techno label Drumcode Records, led by techno legend and head-honcho Adam Beyer, announces the timetable for the first edition of Drumcode Festival that will take place on the 18th of August at the industrial site NDSM Docklands in Amsterdam, The Netherlands. This Summer, one of Amsterdam’s most iconic industrial sites, The NDSM-Docklands, will be transformed into a techno Mecca. The first edition of Drumcode festival will welcome over 25 of the biggest international household names and upcoming talents in the modern-day techno scene, spread out over 4 color-coded stages, each representing a different array in the wide spectrum of the Drumcode sound. Headliner Adam Beyer will take center stage at the Red Stage, where he invites artists such as Joseph Capriati, Pan-Pot, Ilario Alicante, Julian Jeweil and Layton Giordani. The Blue Stage features Mark Reeve, followed by Joel Mull, Bart Skils, Pig&Dan, Marco Faraone, Enrico Sangiuliano and closes off with Amelie Lens. The Purple Stage showcases the heavier side of techno and welcomes acts like Arjun Vagale, Boxia, Harvey McKay, Dense & Pika, Luigi Madonna & Roberto Capuano and ends the night in style with Nicole Moudaber. The Orange Stage, hosted by Truesoul, Drumcode’s little brother label, will represent a combination of house music and techno, brought to you by La Fleur, Tiger Stripes, Reset Robot, Nick Curly, Adam Port B2B &Me and Ida Engberg. For the full line up, tickets and more information, visit drumcodefestival.com. Drumcode Festival is hosted in association with Awakenings.